January | 2015 | And I am an afrotasticlady! Goodbye 2014! What’s up, 2015! It’s a New Year! In 2014, I experienced my share of joys and challenges! I wept and I rejoiced. I grieved and I celebrated. In early 2014, I was accepted into three graduate schools! I felt so thankful to God, as I had not acquired this success on my own strength! God was my strength in weakness. In late 2013, I began the application process a few months after the death of my sister. With God’s help, I pushed through the raw heartache and filled out applications. I composed essays. I requested my transcript from UMass Amherst. I pushed when I felt like my heart was bleeding all over the place. But I made the decision to attend Wheelock College. I was petrified, because I had been out of school for five years. I thought my intelligence had expired. Jk. Seriously, I did not know how I was going to go to school part-time and work full-time. Indeed, it was so challenging. I was very busy and stressed out, but I made it through my first semester. With God, I made A’s in all three of my classes. Hallelujah! In 2014, I learned that I could not force certain dreams to become a reality. I was at the height of my idolization of marriage. I felt that I was growing older, and that it was time for marriage to come. I felt left out as I saw marriages and engagements on Facebook. It grieved me whenever I saw these images on my Newsfeed. In the middle of my idolization, I wanted a certain person to be the ONE! I knew he wasn’t, and God knew he wasn’t either! God knew what I really needed when I thought I knew everything. I deemed marriage as Everything, but God had to be my Everything! I also knew that I needed to be ME! And I could not be ME with the wrong person! And because a person was handsome, kind, and a Christian, it didn’t mean that he was the right person for me. God wanted me to be with the right Christian man made for me! So, I remained single another year. I lamented to God about it, and I realized that marriage could not be the fulfillment of my happiness. I thought about all of the things that I wanted to do before I entered a serious relationship with the goal of marriage. I still had dreams and aspirations that I wanted to complete as a single person. I begun to learn that I could be afrotastically single. I could be a fierce afro wearing single Black woman. I could be content in my singleness! When I reflect on the numerous ups and downs of 2014, I think about the process of learning how to ice skate. Last week, I went ice skating with one of my close friends. At first, I was afraid to put my feet on the ice. Once I put my feet on the ice, I was afraid to make a move. I held onto the barrier and made small, slow steps. I did not want to fall down and have to figure out how to get up. I fell a few times, and I was able to get up! The first time I fell, a complete stranger helped me get up. After an hour or so, I decided that I needed to let go of the barrier and skate freely. So, I did it. 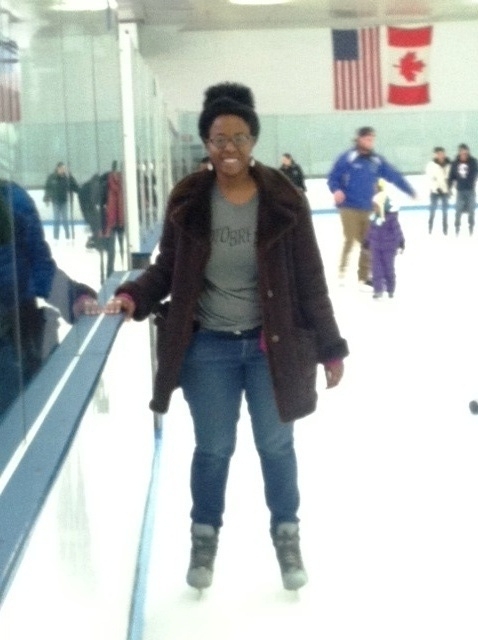 I am not Michelle Kwan, but I learned how to skate with a lot of practice. In 2015, I pray that I approach life in the way that I learned to ice skate. I will experience ups and downs as long as I am a human being on this Earth. But with God and the support of family and friends, I do not have to stay down on the ice. I can rise up and continue to move. I have to remain patient as I embark on certain endeavors. Certain endeavors will take time and practice. Some things will even be a struggle, but I cannot look at the struggle and run away from it! I have to skate through it!